This past Saturday I met a friend and headed to the Friends of Seattle Public Library book sale. It's a huge sale that happens twice a year, most of the books are donated by library patrons and some of them are books the library no longer wants. Everything is $1. I made a beeline for the "domestic arts" section - the last time I was at this sale I found some great sewing books and this time was no different. Many vintage sewing books are real gems; Threads editor Nicole Smith just wrote a post about this very topic. I found Jan Bones' Lingerie Secrets; that alone was worth the trip as it seems to be out of print, used copies are selling for around $35 online right now. And I got a Palmer/Pletsch book on tailoring, a Don McCunn book on patternmaking, and Fashion Sewing by the Bishop Method. This was in the "domestic arts" section too - Rescue Your Nails by Ji Baek, the founder of Rescue Beauty, a group of Manhattan nail salons and nail polish products, neither of which I've tried actually. My recent discovery of a few nail polish blogs has reignited my love affair with polish (a love affair that I know I share with Shannon and Cidell, among others) and I am learning a lot from this book. Oh wow, I'd love it but like kitsnquilts, I'm an antipodean sewer and hate to think what it would cost you to post. I MUST know though, what IS the Bishop method.... off to go google it! You certainly scooped the pool of books - well done! Those are all wonderful books. Enjoy curling up with them and a favorite drink. Thanks for the giveaway! Books for $1 are such bargains - you never get them anywhere where I live. Nice one! I've taken 2 classes with Jan Bones and I have to tell you how much I love her. She is so knowledgeable , one of the best teachers I have ever had. Lucky you for getting her book! I would love a try at it. What a great haul at the library - ours is not that lucky. I would love to be included in the drawing. I have that tailoring book, though I think that mine is falling apart! The lingerie book looks like a terrific find. Wow! What fun finds! I love library book sales for this reason. Please include me in your drawing. Your haul is awesome and the stuff sewing dreams are made of! I would like to be included in the drawing. Great scoop on the library books. I spend a lot of time at thrift stores looking for these, but rarely turn up anything. Too many old cookbooks to find room for sewing, I suppose. Nice! I don't generally luck at my local thrift store for sewing books (or fabric that isn't already in the form of clothing), so I think that's a wonderful find! I missed our library sale this year...but I've found good sewing books in the past. Thanks for doing the giveaway. The books looks helpful! Those are some great finds. I love nail polish too and used to do my own acryilc nails. Oohh...the Lingerie Secrets book is a find!!! I have been searching for one of those for a long time but am not willing to pay $35 yet. I also have the P&P Tailoring book and another early publication of Pati Palmer. Can't wait for PR weekend and her workshops! Please do not enter me in the drawing! 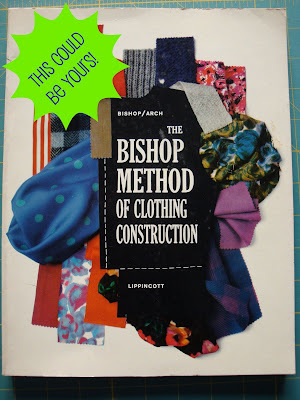 I just wanted to say that I love the Bishop books - have both of them and they are wonderful resources!!! How nice of you to share your great find! I'd love to be included in the drawing. Those are wonderful additions to a sewing library! Thanks for sharing. The potential giveaway makes me a commenter. What great books you found! It reminds me that I should check some of the local used book stores in my neighborhood. I just scored some great books on craigslist (Easy Guide to Sewing - Pants, Linings, and Blouses). I was too happy to add these to my library. Always on the hunt for more. Like others, prompted to comment due to the giveaway! I am collecting sewing books as part of a goal to sew most of my own clothes. I've heard about the Bishop Method and am interested! Thank you! I'm so glad you posted this. My library has a big spring sale May 2nd. I would have forgotten about it. WOW, what a great haul you got! I don't know if our local library does a sale like this, but I'll have to inquire. Please count me in your drawing, that looks like a really neat book. What fun. Count me in. I've heard great things about the Bishop method. I'd definitely be interested in it. And congrats on your haul! Please enter me in your contest. I'm book crazy! What is this new thing for nail polish. I have this dark, dark chocolate red on my nails, as I type this. The Bishop book looks cool. i've just jumped back onto the sewing bandwagon, and so far have cut up lots of material to sew, but haven't actually gotten the machine out to sew it all up. would love to have a chance to win the book, and help to hone my rusty sewing skills! thanks for the giveaway! WOW! That is SOOO kind of you! I will definitely be on the look-out for the next library book sale. And a blog about nail polish? It's amazing! And yet...I'll have to check them out now. Those are some fantastic finds, I love ex-library books! Oh man, I didn't even think about possibly buying sewing books at the Vancouver Public Library sale last weekend. I'll sign up for your giveaway, though! what a generous giveaway, thank you! I've been a lurker for 6 months on your blog - great information, love your style. Please include me in the giveaway. I always like more about sewing! You are really lucky you can actually buy books from the library. I don't usually win anything but let me give this a try. please include me in the give away. Wow! Those are some great finds! Is there such a thing as too many craft books? I am all for learning something new about sewing. Please enter me in the giveaway.